Starter pen meters provide what should be expected of a small, economical pen meter: simple, fast, straightforward, no-frills operation time and time again. With durable ABS housing, a protective sensor cap, and automatic shutdown feature that preserves battery life, Starter pen meters can endure consistent use in rugged environments. Equipped with a wrist strap that prevents unintentional dropping, Starter pen meters are feature an IP67 waterproof design that can prevent water damage when dropped in to liquid. After more than a century of perfecting the art of measurement through our durable weighing products, OHAUS precision is now available in a line of pen meters that provide accurate measurement of pH, oxidation-reduction potential (ORP), conductivity, salinity, and total dissolved solids (TDS). Starter pen meters are the economical option when you are simply looking for meters that will provide accurate measurement without restriction. The ST10 offers a convenient way to measure pH, or the relative acidity or alkalinity of a sample at a given temperature. 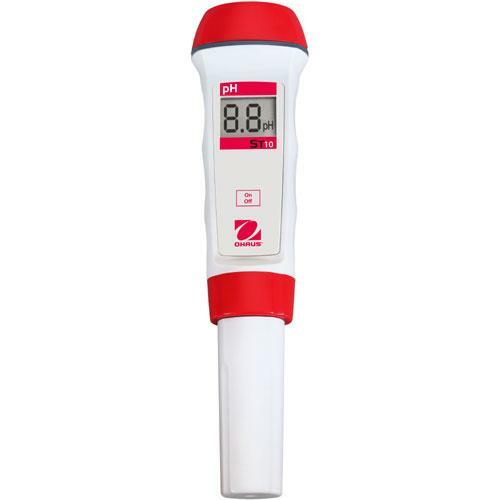 The pH pen meter can be completely operated with just one hand, freeing up your other hand to handle samples. This is a replacement pH10 ST electrode that is compatible with the ST10 Ohaus Starter Series Water pH Analysis Pen Meter.